Jason Donkersloot brings 15 years of prior experience performing underground storage tank inspections to Total Home Inspection Services. He is our Oil Tank Sweep Specialist, and exclusively provides this service to our clients. Jason is well-known among New Jersey Realtors and real estate attorneys because of his lengthy career. A native of Bergen county, Jason now resides in Hawthorne, Passaic county, and performs oil tank sweeps throughout all of northern and central New Jersey. Prior to becoming an underground storage tank inspector, Jason owned his own landscaping company. 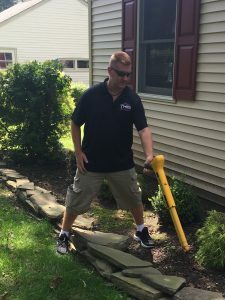 His extensive experience in both horticulture and environmental services makes him one of the most qualified tank sweep specialists in New Jersey. Jason is a sports fanatic (Go Devils! Go Yankees! ), an avid sports collector, and an involved coach for his son’s sports teams. We are delighted to have Jason’s energy and good humor on THIS team!